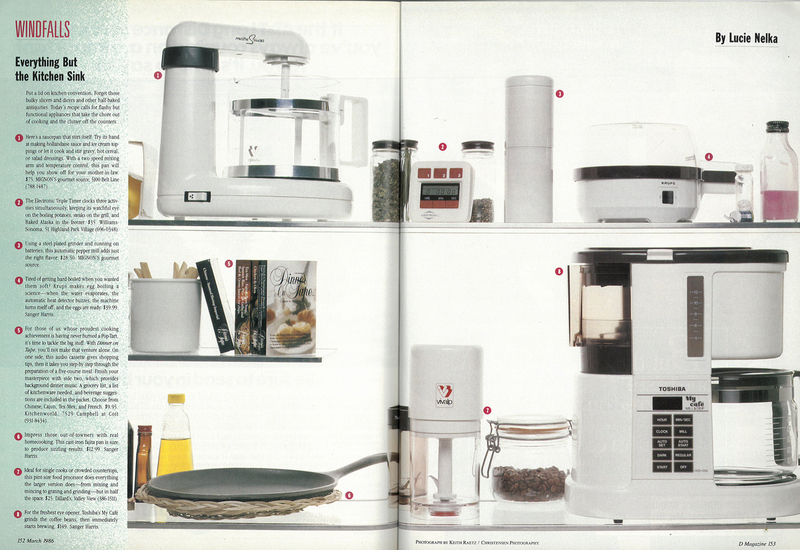 Hey, look at these cool kitchen gadgets from 1986. There’s a saucepan that stirs itself, an automatic pepper grinder, and fancy cooking cassette tapes. Fun, fun, fun. Put a lid on kitchen convention. Forget those bulky slicers and dicers and other half-baked antiquities. Today’s recipe calls for flashy but functional appliances that take the chore out of cooking and the clutter off the counters. 1. Here’s a saucepan that stirs itself. Try its hand at making hollandaise sauce and ice cream toppings or let it cook and stir gravy, hot cereal or salad dressings. With a two-speed mixing arm and temperature control, this pan will help you show off for your mother-in-law. $75. MIGNON’S gourmet source, 5100 Belt line (788-1487). 2. The Electronic Triple Timer clocks three activities simultaneously, keeping its watchful eye on the boiling potatoes, steaks on the grill, and Baked Alaska in the freezer. $35. Williams-Sonoma, 51 Highland Park Village (696-0348). 3. Using a steel-plated grinder and running on batteries, this automatic pepper mill adds just the right flavor. $28.50. MIGNON’S gourmet source. 4. Tired of getting hard-boiled when you wanted them soft? Krups makes egg boiling a science-when the water evaporates, the automatic heat detector buzzes, the machine turns itself off, and the eggs are ready. $39.99. Sanger Harris. 5. For those of us whose proudest cooking achievement is having never burned a Pop-Tart, it’s time to tackle the big stuff. With Dinner on Tape, you’ll not make that venture alone. On one side, this audio cassette gives shopping tips, then it takes you step-by-step through the preparation of a five-course meal. Finish your masterpiece with side two, which provides background dinner music. A grocery list, a list of kitchenware needed, and beverage suggestions are included in the packet. Choose from Chinese, Cajun, Tex-Mex, and French. $9.95. Kitchenworld, 7529 Campbell at Coit (931-8454). 6. Impress those out-of-towners with real home-cooking. This cast-iron fajita pan is sure to produce sizzling results. $12.99. Sanger Harris. 7. Ideal for single cooks or crowded countertops, this pint-size food processor does everything the larger version does-from mixing and mincing to grating and grinding-but in half the space $25. Dillard’s, Valley View (386-1511). 8. For the freshest eye opener, Toshiba’s My Cafe grinds the coffee beans, then immediately starts brewing. $149. Sanger Harris.